For 2016, we would like to reach out to more colleagues and organizations in more countries. We invite members with an interest in similar activities to contact us and become actively involved. We also invite members with personal connections with colleagues in other countries and international organizations to join us for the coming year. ACNM IAC offers ACNM members opportunities to network with Nuclear Medicine physicians in various countries representing ACNM. Members of the ACNM also have the opportunity to be ACNM Visiting professor to different countries. This is a unique opportunity and we hope you would join us. If you are interested, please send an email to ACNM IAC email: acnmiac@gmail.com. 18F-sodium fluoride ([18F]NaF) is a well-established bone-seeking agent for the detection of bone metastases. 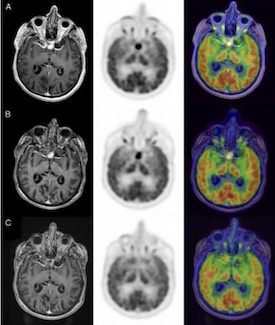 There have been numerous attempts to apply qualitative and semi-quantitative [18F]NaF PET/CT to common benign osseous and arthritic conditions. 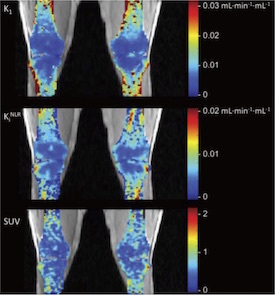 In Kinetic [18F]-Fluoride of the Knee in Normal Volunteers, Haddock and colleagues investigate parametric values for [18F]NaF 50-minute list-mode uptake in specific bone regions in 12 normal knees using simultaneous PET/MR localization. The image-derived input function was determined from the popliteal artery. Using a Hawkins model, Patlak analysis was performed to obtain Ki (Ki pat) values and nonlinear regression analysis to obtain Ki NLR, K1, k3/(k2 + k3), and blood volume. Comparisons for the measured kinetic parameters, SUV, and SUVmax were made between subchondral, cortical, and trabecular bone and between regional subsections of subchondral bone. Cortical bone had the highest [18F]NaF uptake, differing significantly in all measured parameters when compared with trabecular bone and significantly higher SUVmax and K1 than subchondral bone. Subchondral bone had significantly higher SUV, SUVmax, and Ki than trabecular bone tissue. Regional differences were observed in K1 and k3/(k2 + k3) values. 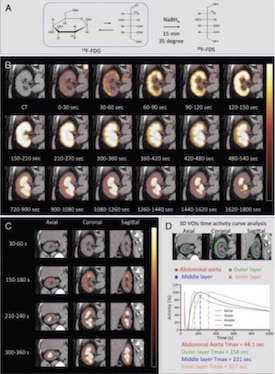 They concluded that quantitative [18F]NaF PET/MRI is sensitive to variations in bone vascularization and knee joint metabolism. Clinical Nuclear Medicine. 44(5):347-350, May 2019. Clinical Nuclear Medicine. 44(5):351-358, May 2019. Clinical Nuclear Medicine. 44(5):359-364, May 2019. Clinical Nuclear Medicine. 44(5):365-376, May 2019. Clinical Nuclear Medicine. 44(5):377-385, May 2019. Clinical Nuclear Medicine. 44(5):386-393, May 2019. Clinical Nuclear Medicine. 44(5):e318-e322, May 2019. Clinical Nuclear Medicine. 44(5):e323-e328, May 2019. Clinical Nuclear Medicine. 44(5):e329-e335, May 2019. Clinical Nuclear Medicine. 44(5):e336-e341, May 2019. Clinical Nuclear Medicine. 44(5):394-396, May 2019. Clinical Nuclear Medicine. 44(5):397-398, May 2019. Clinical Nuclear Medicine. 44(5):399-400, May 2019. Clinical Nuclear Medicine. 44(5):401-403, May 2019. 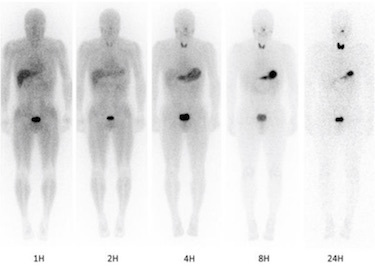 Clinical Nuclear Medicine. 44(5):404-405, May 2019. Clinical Nuclear Medicine. 44(5):406-407, May 2019. Clinical Nuclear Medicine. 44(5):408-409, May 2019. Clinical Nuclear Medicine. 44(5):410-411, May 2019. Clinical Nuclear Medicine. 44(5):412-413, May 2019. Ng, Thomas S. C.; Sakellis, Christopher G.; Jacene, Heather A. Clinical Nuclear Medicine. 44(5):414-416, May 2019. Clinical Nuclear Medicine. 44(5):417-419, May 2019. Clinical Nuclear Medicine. 44(5):420-423, May 2019. Clinical Nuclear Medicine. 44(5):424-425, May 2019. Clinical Nuclear Medicine. 44(5):426-428, May 2019. Clinical Nuclear Medicine. 44(5):429-430, May 2019. Clinical Nuclear Medicine. 44(5):e342-e344, May 2019. Clinical Nuclear Medicine. 44(5):e345-e346, May 2019. Clinical Nuclear Medicine. 44(5):e347-e348, May 2019. Clinical Nuclear Medicine. 44(5):e349-e350, May 2019. Clinical Nuclear Medicine. 44(5):e351-e352, May 2019. Clinical Nuclear Medicine. 44(5):e353-e356, May 2019. Clinical Nuclear Medicine. 44(5):e357-e359, May 2019. Clinical Nuclear Medicine. 44(5):e360-e361, May 2019. Clinical Nuclear Medicine. 44(5):e362-e363, May 2019. Clinical Nuclear Medicine. 44(5):e364-e366, May 2019. Clinical Nuclear Medicine. 44(5):e367-e369, May 2019. Clinical Nuclear Medicine. 44(5):e370-e371, May 2019. Clinical Nuclear Medicine. 44(5):e372-e374, May 2019. ACNM is inviting international nuclear physicians, scientists, residents in training, nuclear pharmacists and industry to apply for full ACNM membership. Clinical Nuclear Medicine includes SAM-CME certified content that is designed to meet the educational needs of its readers. For more information on CNM SAM-CME educational offerings, visit the Lippincott CMEConnection portal to register online and take advantage of the free CNM SAM-CME opportunities. The module fulfills the requirements of the ABNM Maintenance of Certification program for 2.00 SAM credits in the Nuclear Medicine clinical category. In early February, author, Carol S. Marcus, PhD, MD submitted a petition to the U.S. Nuclear Regulatory Commission (NRC) to reject the linear-no threshold (LNT) hypothesis and ALARA as the bases for radiation safety regulation in the United States, using instead threshold and hormesis evidence. Her article briefly reviews the history of LNT and its use by regulators, the lack of evidence supporting LNT, and the large body of evidence supporting thresholds and hormesis. Physician acceptance of cancer risk from low dose radiation based upon federal regulatory claims is unfortunate and needs to be reevaluated. This is dangerous to patients and impedes good medical care. A link to the petition is available and support by individual physicians to publicly comment is extremely important. We are excited to inform radiologists about the availability of Clinical Nuclear Medicine's high-impact articles from 2014 to 2015. You will surely enjoy the line-up of highly-cited, cutting-edge articles.